HomeBlogHas the EPA Approved Commercial Duct Cleaning? Commercial duct cleaning for an office building makes for a safe workplace. Contamination within the ducts can have a number of detrimental effects on the health of employees. Poor air quality results in numerous problems, both in comfort and in safety. Molds, fungi, bacteria, mildew and algae should be eliminated with all speed so they aren’t circulating in the air within a commercial business. There are liabilities to having toxins and pollens being pumped in through the ventilation system in a commercial building. Reports have shown that it can lead to a decline in productivity, absenteeism increasing and potential healthcare liabilities. The EPA (the United States Environmental Protection Agency) provides a lot of information on their website about the importance of getting the ducts of your heating and air unit cleaned when needed. And yes, they have approved commercial duct cleaning with particular standards that a duct cleaning company should meet. Homes and businesses throughout the United States discover that when their heating and air ducts are fouled with molds and other contaminants, not only are health issues a situation, but the cost of energy goes up. Often times when you find microbe contaminants within the duct system, you will also find heavy accumulations of dirt, dust and pollens. The heating and cooling equipment may not operate effectively and efficiently, so money savings can be a large part in getting duct cleaning done. Hiring someone to clean the air ducts and blower units of the HVAC system in your place of business requires some research. You want to hire only those who are qualified and can do the job right. 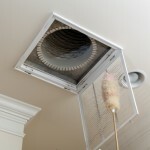 Although the procedure is not always required, the company should optimally know how to sanitize the duct work, eliminating those harmful microbes. Most importantly, any janitorial company hired to do this work should comply with the standards put forth by the EPA. The company should have a track record of successful work and be members of the National Air Duct Cleaners Association (NADCA). The chemicals the company uses in cleaning the HVAC system must meet EPA and OSHA standards. They must take proper precautions so the fumes of the chemicals used won’t be circulated within the building. What sort of experience do they have in duct cleaning? Have they worked on similar systems to yours? Do they comply with the standards of NADCA? Are the products they use to clean ducts approved by the EPA? Ensure your safety and confidence by hiring only a company that will fit the standards of the EPA. Keep your business safe and your employees healthy.